Expert Bee, Wasp, and Yellow Jacket Removal. Do you have a swarm of bees? The Bee Man is your trusted Aliso Viejo Bee Removal expert. Bee swarms can be very scary and frightening. The loud buzzing of the swarm and the cloud or bundle of bees can make anyone nervous. For your safety and the safety of those around you, The Bee Man is your Aliso Viejo bee removal solution. Because of its award-winning schools, attractive neighborhoods and great shopping, dining and entertainment, Aliso Viejo (www.cityofalisoviejo.com) is a popular place to live and work. As a result, Aliso Viejo has a growing population of approximately 50,000 residents who enjoy approximately 280 days of sunshine each year. Because of its climate and location, Aliso Viejo is also popular with bees. 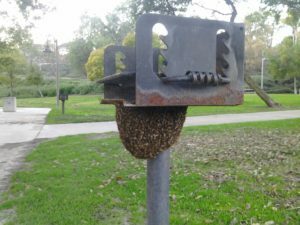 Residents often find themselves outdoors and in parks, where bees sometimes like to swarm and build their hives. Residents should be careful to not disturb any bee swarms. Likewise, do not approach any beehives in the area either. There are a lot of trees, water, and homes which attract bees. Consequently, bees have many nesting opportunities. These bees often find their way into homes and backyards (see our graphic about where bees like to build their nest) which may frighten residents. Furthermore, beehives can also cause a lot of property damage. So, finding a trusted Aliso Viejo bee removal company is important. Should you need expert bee removal services, please call The Bee Man today at (949) 455-0123.